They are so handy, but get a little spendy after a while, so I decided to create these homemade low sugar protein bars based on EPIC® Bars. They are the perfect protein-and-fat snack to have when you just need something to tide you over until your next meal. And, they’re low in sugar, so they won’t send you into a sugar-craving withdrawal tailspin! You just need a dehydrator to make them, but you could also make them in an oven set to its lowest temperature with the door cracked open with a wooden spoon. If you want to do your own reset and experience the power of real food to help you reduce sugar cravings, have more energy, sleep better, have clearer skin, effortless periods, and favorite jeans that fit perfectly, now is the time to get started! Check out my ebook, Radiant Reboot: Reclaim Your Health, Increase Your Energy & Reboot Your Life in 30 Days. It walks you through doing a real food challenge step-by-step, giving you actionable tips along the way. It’s a nutrition coach in a book: everything I would teach you if I were working with you one on one as one of my clients. 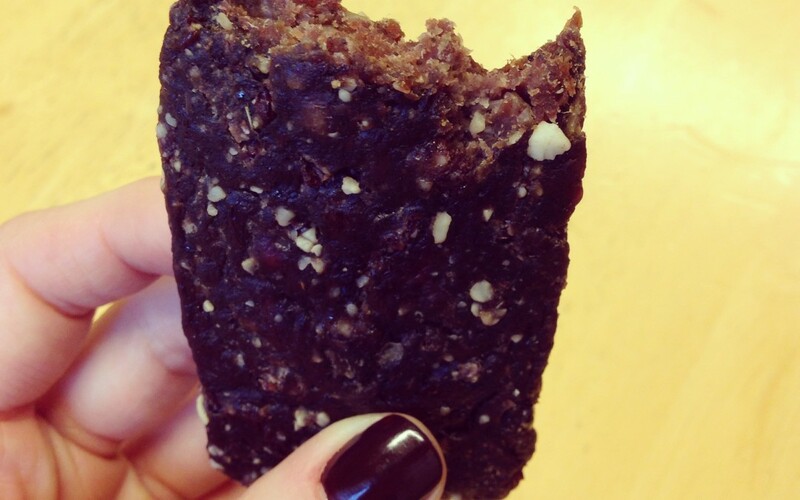 Low sugar meat-based protein bars. Put all the ingredients except the meat into a food processor and blend until it becomes a paste. If you don't have a food processor, you can chop the nuts up very finely and then mix it with the remaining spices and coconut aminos. Mix the pecan mixture with the meat by hand until it's all combined. Form the meat into bars that are about 4-5 inches long, two inches wide, and a half inch thick. On parchment paper cut to fit the size of the dehydrator, or cut to fit the size of the tray in the oven, place the bars side by side, but not touching, so that air can flow around them. Dehydrate the bars for 6 hours. They will darken but still be moist in the middle. Store in ziplock baggies and take them with you in your purse for a snack to have throughout the day. I like to store mine in the freezer, wrapped in plastic wrap, and take one out at the beginning of the day to bring with me in my purse for the day. These are so yummy! I’ve made 3 batches already! I used dates instead of cranberries or blueberries bc I couldn’t find any without added sugars. Question: do you have any other recipes for homemade epic bars? I wanna try with different spices and maybe ground chicken? Just wanted to change it up but not sure what flavors would go well. These are awesome! I’m so glad you love them!! These are one of my favorite ever things to make. I don’t really have any other recipes, but you could keep the same ratios of some sort of nut to some sort of protein, plus whatever spices you want, and any dried fruit for some sweetness and a kick of energy! If you look at a health food store, you might be able to find dried cranberries or blueberries without sugar. Even if it does have added sugar, it’s just a bit of fruit, so I would think it would be okay for sugar content. I know the Epic brand has a chicken sriracha bar. If you were to do chicken, I would cook the chicken first by baking or slow cooking, then pulsing with a food processor with the other ingredients until it’s fine and all mixed together. I bet some sort of Moroccan/African chicken would be awesome, like chicken + Za’atar or chicken + Ras el Hanout or chicken + Berbere seasoning. (You can easily Google recipes to make your own of those spice blends). I’ll have to keep playing with it, too. It sounds like a rabbit trail I could easily (and gladly) go down! Good luck! So uncooked ground sirloin? Just making sure. I wonder if you could dehydrate your own berries to add? I haven’t personally tried it, but I bet it would totally work! Yum! Great idea! I’d love to make the Chicken Sriracha Epic Bar. Could I swap the ingredients the package calls for and just follow your cooking instructions? How is the texture compared to the real thing? Thanks. I’m glad someone decided to give these bars a try! Epic uses Chia, that would bind it all together for sure. Hi! I noticed you recommend cooking the chicken first. Do you recommend the same for the beef or pork or turkey. In short should the meats be cooked befor mixing and dehydrating? What temperature do you cook it at to dehydrate it? My dehydrator didn’t have a temperature setting, so if yours does, I would just recommend medium. This looks very interesting. How many bars does the repie make? It sort of depends! I would say maybe about 10-15, depending on how big you make the bars, and whether you decide to add dried fruit. Hey, can we store these outside the refrigerator for a few days? To be honest, I’m not sure. I usually keep them in the fridge or freezer. My thought is that yes, that it would be like jerky, but I’ve never really wanted to risk it! I took these backpacking in 90 degree heat for 9 days. I had no problem with mold or spoilage. I love this! How long would I leave these in the oven though? This looks really good. I’m going to try this with some venison. Ooh, I bet venison would be delicious! Let me know how it turns out! Do you think these would work well without the nuts? Or are they sort of a binder? Thank you for the reply!! Not a nut allergy – I just try not to overdo the nuts . I made these the other day with walnuts (what was on sale) and they are so good! Better than epic bars. Thanks for the recipe. I will be remaking these again and again. My dehydrator goes up to 155 degrees… what temp do you recommend for the 6 hr dehydration? Hey Rosemary! Nice name! 😉 My dehydrator only had one setting: “on”, so I’m not quite sure about different temps. However, if I were you, I would perhaps do a medium temperature and then check the bars at 5 hours in and see if they need more time. I generally break one apart to make sure there is no pink left in the middle. It’s not really an exact science, so you could try longer or shorter to see what you like! I’m not sure, but you could roughly calculate by finding out how much protein is in ~4 oz ground beef. I also don’t know about the calories, but I count nutrients, not calories. 😉 And these are nutrient-dense! Currently following AIP so can’t do nuts but I did substitute sliced tigernuts for the pecans and used bison. I’m happy with my new portable protein snack. Bobbi, what a great idea! I wouldn’t have thought of using tiger nuts; I think that’s genius! I’m glad you’re happy with it. Happy cooking! Quick question, are you mixing lean raw ground beef with fruit and nuts mixture, because it’s not listed on your recipe sheet. I just want to make sure that I do it right, and that this doesn’t end up in an epic fail. Yes, that is correct! I’ll update the recipe to make it more clear. Also, “EPIC fail”… good pun! What tempurature do you dry them in the oven for 6 hours at? The lowest setting your oven can go to, and prop the oven door open with a wooden spoon. It will likely still go faster than a dehydrator, so I would check for doneness around 3 hours, and every hour after that until you get to your desired texture/doneness. So two weeks ago I made your recipe, the only change I made was I added some unsalted sunflower kernels to the mix. When finished it kinda reminded me of breakfast sausage, while not bad, not my favorite. So I started toying with the idea of something more to my taste, I make them to help when my blood sugar is low and I need a boost. So I used some of the original ingredients, lean ground beef, pecans, cranberry, coconut aminos, ground ginger, but added, toasted coconut, and dehydrated pineapple, dash of nutmeg, white pepper, sunflower kernels, and just a tablespoon of real maple syrup. Thanks for giving me a jumping off point! I love that you took the recipe and made it your own! The recipe sounds excellent, and I’m glad you loved it! I fully planned on making a copycat Epic bar, and stumbled on yours while researching vegetable bars, the new darling of the snack bar world. I truly appreciate your advance work here. Regarding dehydrating meat, however, commercial jerky requires a cure, as does any home made you plan on storing outside of refrigeration. Natural bacon uses celery powder cure, which can be purchased. It’s a natural nitrate or nitrite, I can’t remember which. The Epic bar uses celery powder as a cure. Without some form of cure to protect from nasty bacterias, it’s best to store these in the fridge. Example, jerkyholic.com’s ground meat jerky recipe indicates 1/4 tsp cure #1 product (quick cure, as in jerky), or double regular salt. It is also required to heat the product to 160° to start with, for safety’s sake, and leave it there for awhile, reducing to medium later. This can be done in the oven,cir in dehydrator with a thermometer if you don’t have a temperature gauge. This is all ESPECIALLY true with pre-ground meat, which has had any bacteria spread throughout, as opposed to a hunk of meat which only has bacteria on the surface. This is all per USDA. I’ve been grinding raw chicken and red meats for cat food for two years; a little research is called for here, folks! All good points; I thought I mentioned in the post that I keep them in the freezer and then take out one when I’m taking it with me for the day and it defrosts by the time I’m ready to eat it, but I realized now I didn’t. I would recommend doing that to make sure it doesn’t go bad. Like the EPIC bar….very expensive though….think I’ll try with Costco chicken breast and go from there….thanks for the recipe! That’s a great idea! I decided to make my own for the same reason – cost! Enjoy! Made a double batch today… Used 90/10 ground sirloin I found on sale at Kroger for $2.50#! With the other ingredients factored in, I made 18 larger epic bars for roughly $8!! Normal price for an Epic bar at Kroger is $2.99 apiece… And I swear they have gotten smaller each passing year. I did however use Morton tender Quick at 1.5 tsp per # of meat just because it is ground meat… I don’t like using nitrites but I can’t find celery powder anywhere and I added crushed red pepper to heat them us just a tad… Great recipe.. 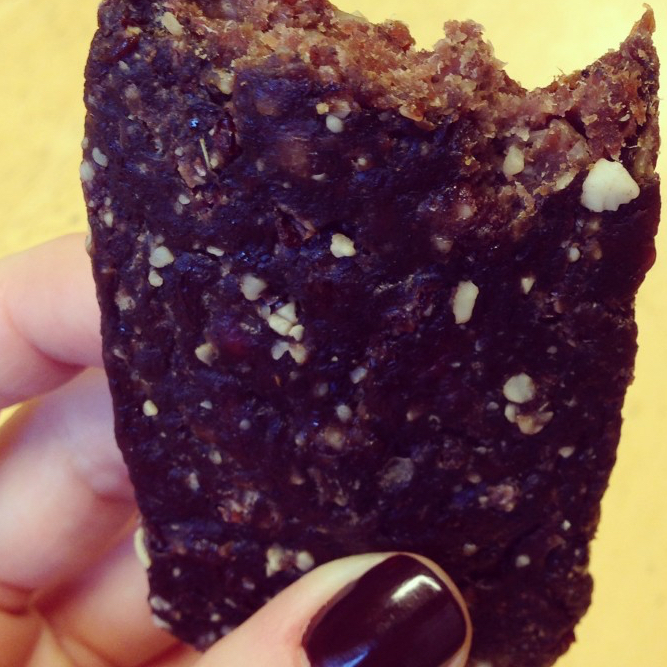 Thank you for sharing cause there isn’t much out there when it comes to knock off Epic bar recipes…. Yes, I agree that they get so expensive so quickly! I am a huge proponent of frugal living and so making these makes me feel like I outsmarted the system. 😉 Enjoy! The bison cranberry bar lists bacon as one of their main ingredients. Have you tried that? I’m wondering what the bacon/beef or bison ratio would be.